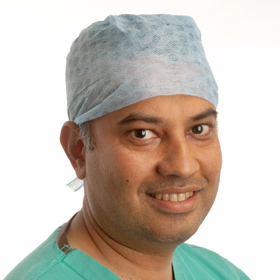 Nimish Shah came to Cambridge in 2004 to develop minimally invasive (keyhole) surgery. He trained in a number of centres in the UK, Europe and America in laparoscopic radical prostatectomy and robotic prostate surgery. He helped with the introduction of robotic surgery for prostate cancer at Cambridge, and is one of the most experienced robotic surgeons in the UK. He has a keen interest in teaching and training, being a registered trainer for robotic prostatectomy with Intuitive Surgical. He has trained a number of surgeons in the UK in robotic radical prostatectomy. Nimish has a keen interest in improving outcomes and recovery following robotic prostatectomy. He was a Principal Investigator in a multi-national clinical trial looking at improving erectile function following radical prostatectomy. Nimish has been a co-investigator of various clinical trials including looking at novel agents to assess their effectiveness in prostate cancer. All suitable patients attending the robotic clinic have the opportunity to hear about the latest clinical trials that the unit is currently recruiting to. Nimish is the lead Robotic prostatectomy Surgeon in Cambridge. His reputation and surgical outcomes routinely attracts patients from abroad. Read about our Results for Robotic Radical Prostatectomy.